What is the purpose of reenactment? June 8, 2002. Tim, Frank and Harry are visiting the invasion museum at Utah Beach, Normandy, France. We are wearing HBT's, leggins, wool shirts, helmets and invasion armbands with the American flag. An little old lady comes up to us, in tears, she clasps our hands and says that if it weren't for the Americans France would have gone to seed under the 'boche', all would have been lost. And if it weren't for us 'youngsters' keeping the memory alive, all that sacrifice would now be forgotten. Well, perhaps that is putting it a bit strong. I don't think re-enacting is that important but it made us feel good about it. And I guess it does help to keep the memory alive a bit longer. Inevitably the old soldiers are 'fading away'. And at times one does feel that all this walking around in 40's uniforms is just too silly and perhaps you ought to quit and 'get a life'. But there are also many moments like the above. And it sure is a good way to meet up with veterans while they are still with us. We were driving along in Eugene our jeep through Hedgerow Country when we came upon a sign; some MP Co. Kickoff Point with an arrow pointing thattaway. So our driver Cpl. Lucky took us thattaway to stumble onto a camp. Two neat rows of small wall tents, and at the end we found Mr. Robert White, 501st PIR, combat medic and silver star winner. He was there at the invitation of some other Dutch re-enactors, who were 'dressed' as airborne troops. Some did not quite look the part (Never mind the paunches guys, but get rid of the beards and if you can't find GI Ful-Vue specs get contact lenses!). But they tried and really had their hearts in the right place. Not only had they arranged for Mr. White to come over, they also had a monument made up and had it erected at Angoville-au-Plain where back in 1944 Mr. White had earned his silver star taking care of some 80 wounded both American and German, in the church while it was under artillery fire. We attended the unveiling ceremony. Now ceremonies always take too long if you ask me but this one was nice anyway. And Mr. White was given a really nice gift; a beautiful painting of that church. It moved him to tears. Who says reenactment is silly? Hans Polak eat your heart out. The morning of June 6, 2002 saw the four of us on the now ever so quiet Utah Beach. Did over 20,000 American soldiers and 1,700 vehicles really come ashore here on that fateful day in 1944? In the face of those now rusty guns set in now crumbling concrete? The war is over, things have changed and sometimes it is hard to stay in your role of GI. Like when you get bored or get a bit tired of the whole sharade. These things happen. 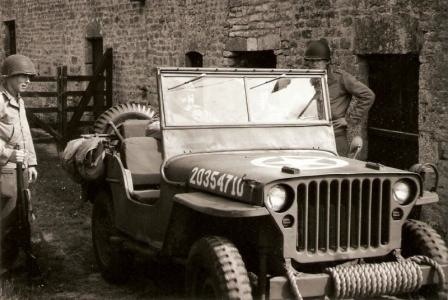 But when you got your jeep, adorned with ration boxes and musette bags, parked on the church square at Ste. Mère-Eglise where 'John Steele' is hanging from the steeple still, and you stand there with your M-1 rifle slung over your shoulder, wearing your best GI combat uniform, doing your latest gimmick; smoking a pipe, and people come up and ask if it is o.k. to take pictures, and in true GI fashion, and in your best American accent you go like, "Why sure Ma'am, Sir, that's what we came here for. Where do you want us; next to the jeep or in front? Have some gum, kid! ", and you give them kids some gum, put your arm around them or pick 'm up (you'd be arrested if you did this in civvies) and give the cameras your brightest smile. Well I must say that makes you feel pretty darn good about your 'hobby'. 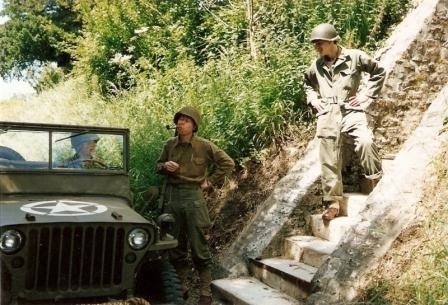 And, boy, is Normandy beautiful when seen from a open jeep (no license plates of course), driving through the bocage, whilst holding on to your helmet. Some of those small roads are truly like green tunnels. And you can imagine it must have been a green hell on advancing GI's with so much cover for a defending enemy. Time however has not stood still, even in this remote part of France. Roads that were hardly paved trails in 1944 are now all macadam roads. Tourism and the introduction of cars, tractors and other farming machinery has left its mark. In fact tractors suddenly appearing on a single car width road were the only 'danger' now. We had to back up a couple of times. But the drivers were most friendly and waved in appreciation when we had backed up to a spot where they could pass. And there are still lots of beautiful old farmhouses that look like time has passed them by. 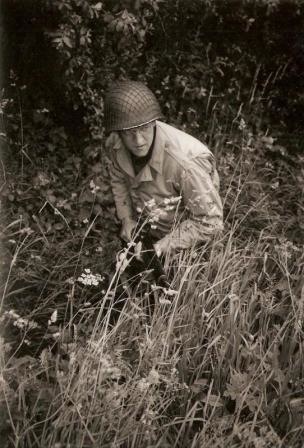 For instance the Marmion farm that we visited, at Ravenoville, where Easy Company's Forrest Guth clowned on June 6, 1944 with a found German helmet. It looks now abandoned or perhaps it is used as a summer house and the only surrounding troops are of the true bovine kind. With detailed maps we crisscrossed the area between the invasion beaches and Ste. Mère-Eglise, using mainly small roads and trails. We stumbled on the bunkers that once housed the batteries at Crisbecq and Azeville, formidable fortifications located right on where the land rises up from the coastal plain, thus covering all of the invasion beaches. Their big guns, 150mm at Azeville and 210mm at Crisbecq, posed a formidable threat to the invading forces and caused most of the casualties and damage on the Utah landing beaches. When you drive up from the coast you can see that in the early days of the invasion no GI could have driven those coastal roads like we did since he'd be a sitting duck for those German gunners. When they were captured after some bitter fighting, the casemates were blown by Engineers. They still look very impressive today. June 6th, 58 years after D-Day, left the Ste Mère Eglisians unperturbed as it was Thursday, market day, and a market is what they had on the church square. But on Saturday June 8 there were British and American paratroops who jumped over the former dropzones at La Fiere where there is still a foxhole supposedly once occupied by General James Gavin. This time it was from C-130 Hercules Transports, dropping sticks of 14 at a time, using what appeared to be T-7 round canopy chutes, so it looked a bit like 1944. 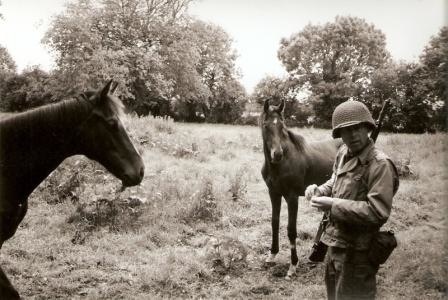 Later on I saw on period maps that the trail we used to skip the traffic jam from the town to the drop zone was the only road to La Fiere in 1944. Having a jeep that can handle these little roads pays off in many ways. In the evening we closed off our week in Normandy by attending, and with Tim even participating in, a wonderful show at Ste. Mère-Eglise with a lot of re-enactors portraying the war in this small Normandy town in about 30 minutes, starting with civilians being started by the invading German troops, complete with two Voltswaggon cars and motorbike with sidecar. Then the gloom of occupation ending suddenly by paratroopers giving the Germans the boot. 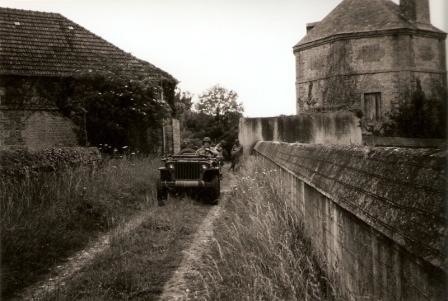 Then jeeps and Dodges of the 4th division linked up with the paras and all was well again with France. U.S. paratroopers even had drinks with Waffen SS men in camouflage outfits, as they were all reenactment friends. The show was topped by a colorful display of fireworks of the friendly kind. No shrapnel this time, no casualties, just another liberation celebration at Ste. Mère-Eglise, Normandy. Will we be back for more in say two-thousand-four? You can bet your bottom dollar we will.